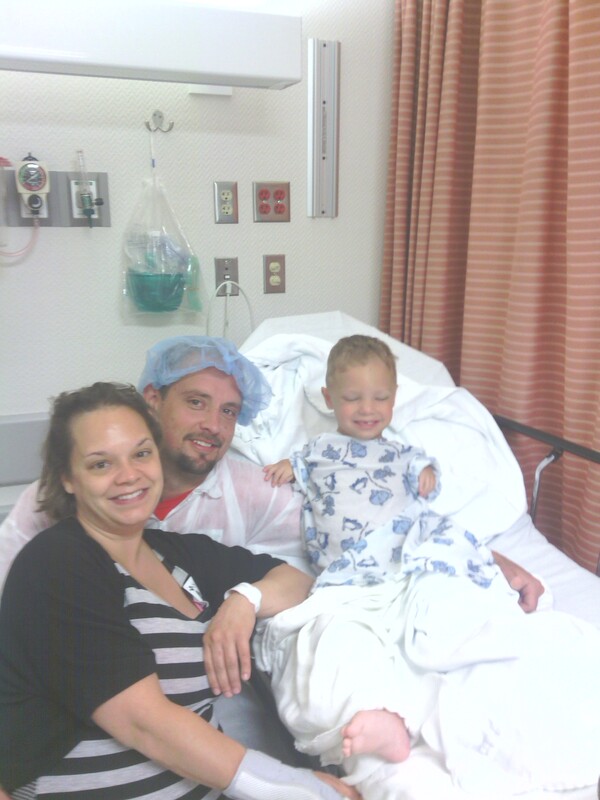 Surgery to remove Drew’s last fixator was completed last Monday and went well. Though we were surprised and disappointed that Drew was placed in a spica cast despite our earlier hope that he would be placed in a more comfortable and less restrictive long leg cast. Drew was quite distraught having woken up unable to sit up as he expected and spent the next day and a half not letting us forget how miserable he was. I didn’t expect him to be happy with the inability to sit up again, but I was surprised to see that he took it so hard. I felt so bad for the poor little guy. He struggled to play with his toys, he struggled with reaching his food to feed himself, he tosses restlessly throughout the night desperately looking for a comfortable position. But, after two days of moaning and feeling sorry for himself, he seemed to accept it for what it is and has since returned to his normal cheerful self. He has even requested to use the toilet again! The fixator was just too heavy and posed too much of a risk of falling off of the toilet to allow him to use it so he’s been confined to diapers. We didn’t anticipate even attempting the toilet again until after the spica cast was removed since the cast prevents him from moving his leg outward. But, Drew asked to go to the toilet and I’ll be damned if I won’t jump at the chance to let Drew feel like a normal kid again and he did great. He’s not back to underwear yet, but I’m so glad to see that I don’t have to go through “potty training” again as I feared I would. He remembers from last time and doesn’t have a problem picking it back up. We got to go and buy new shoes for Drew for the first time in over a year! 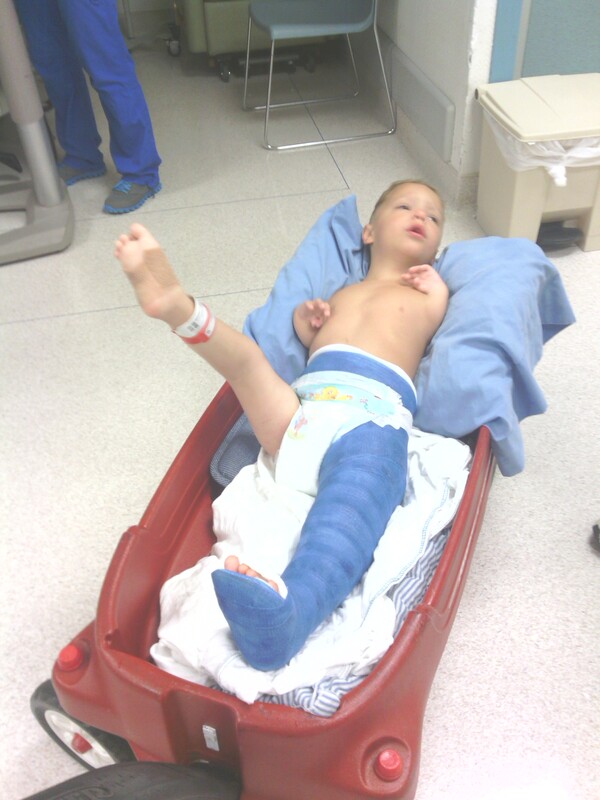 Also, Drew has enjoyed standing on his legs, something he didn’t get to enjoy the last times he was in a cast. We held him up to minimize the amount of weight he bore on his cast leg as he wasn’t allowed to put weight on it for a week per surgeon’s orders, but today he was allowed to finally stand more independently. He walked around in his gait trainer for a short period of time and is excited to have accomplished that. Drew has even enjoyed doing “exercises” on the fold-down futon with his cast, army-style crawling back and forth, rolling over, leg lifts (brace leg), etc. He’s finally realizing all of the new freedom he has sans fixator. So, life with a spica cast hasn’t turned out to be that bad after all. But, that’s not to say we aren’t looking forward to having it removed! So, he’ll have it removed on July 1st and we’ll go in for the first brace fitting the following day. Hopefully, we’ll get the brace in a week and then be allowed to come back home to Kentucky. During the surgery, a metal rod was placed alongside Drew’s left femur to prevent another fracture similar to what happened on the right during therapy so we’ll have to make one more short trip back to West Palm Beach to have it removed in three months. And then, folks, I presume that Drew’s corrective surgery process will be complete! 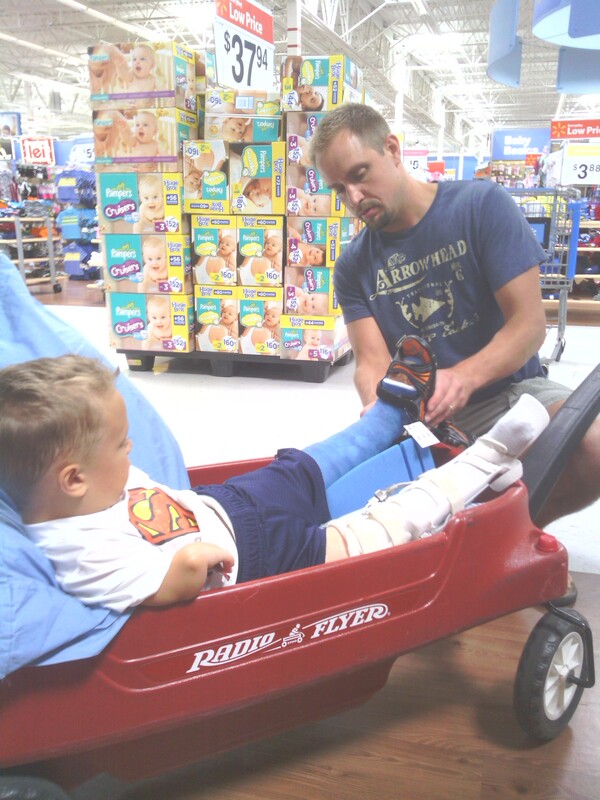 Drew will undergo intensive physical therapy to regain strength and learn to walk, hopefully 100% independently. I don’t know how long it will take to get there, but I know that anything – ANYTHING – will be easier than these last 13 months. And, I know Drew can do it. In other news, I would like to announce the birth of Drew’s little brother, Holden Grey. 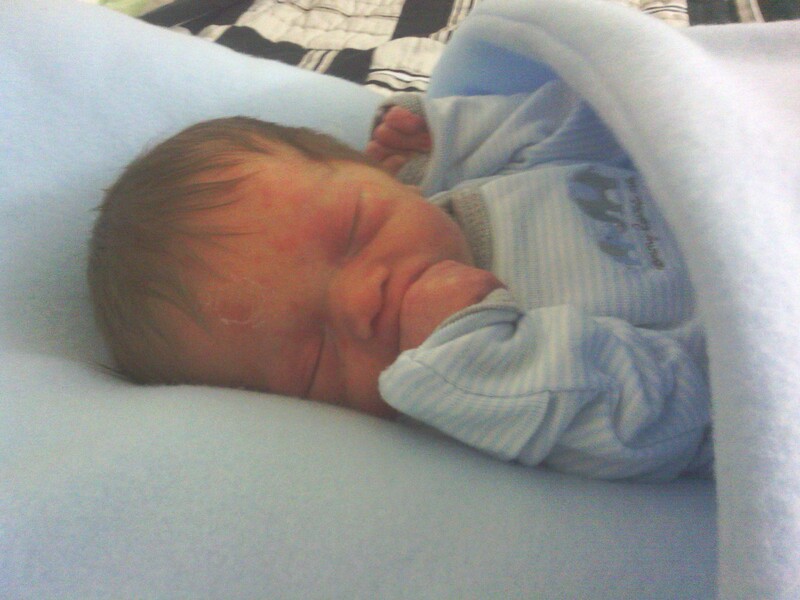 He was born Friday, June 7th at 11:48 am in Wellington, FL weighing in at a whopping 5 lbs 10 oz. He’s a doll! Drew was able to come visit Mommy and Holden in the hospital a couple of times, but he doesn’t seem to be impressed with the new baby. He did “ooh” and “awww” at him the first time looking at him, but since, Holden doesn’t seem to really be present in Drew’s world. Drew is just carrying on as if nothing has happened. I guess it’s a good thing for now as I was worried he’d be jealous or perhaps have sudden realizations that not all kids are born with short arms and malformed legs (Drew has said things that leads me to believe that he thinks his arms and legs, wheelchair, etc. are part of every human being’s growing up process and that he (himself) will eventually be as “normal” as the rest of us at a certain age.) I’m sure that Drew will warm up to Holden eventually. 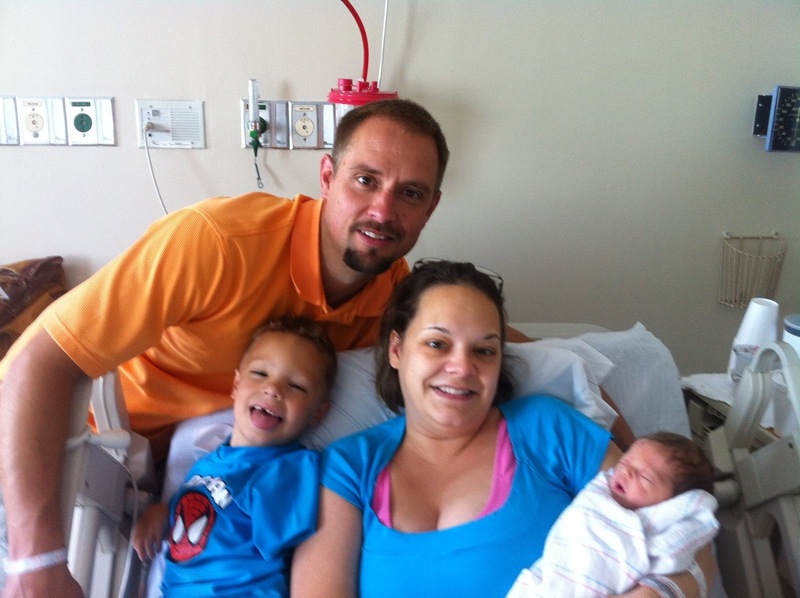 For now, I’m glad that Drew is able to go through each day as if nothing has changed because I think that’s the goal of all families who introduce a new family member: to ensure that older kids don’t question their place in the family or feel neglected with all of the attention going to a new baby. Drew will always be our Drew Baby and nobody and no thing can ever come between us. And, now with another impossibly cute boy in our family, we are only happier and more blessed!